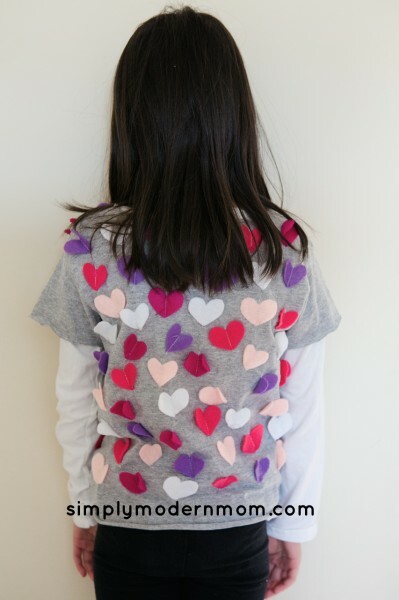 I call this the ‘Heart Attack Shirt’ where she is attacked with 100 hearts for the 100th day of school and/or Valentine’s Day. The 100th day of school crept up on me and this was totally a last minute craft where I started it and finished it the night before she had to wear it to school. Scrimping through my craft closet, I found a spare blank child size t-shirt and leftover felt from previous projects. And with Valentine’s Day coming up, I figured this shirt could also double as a Valentine’s Day shirt. So I got to work. If you want to make this shirt, I didn’t take pictures as I went along but I’ll tell you how to make the shirt. It’s a simple project, just took some time because you are dealing with 100 hearts! All together it took me about 4 1/2 to 5 hours to make this shirt from start to finish. 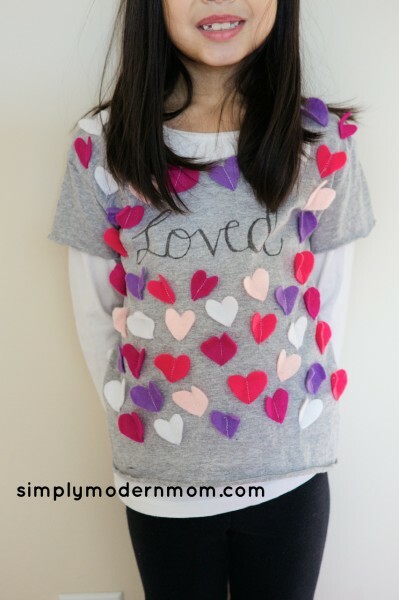 Make a small heart pattern on paper and cut it out to use on felt. You can also make the hearts in various sizes. Trace 100 hearts onto the felt. I used a pen because the pencil didn’t show up very well on the felt. 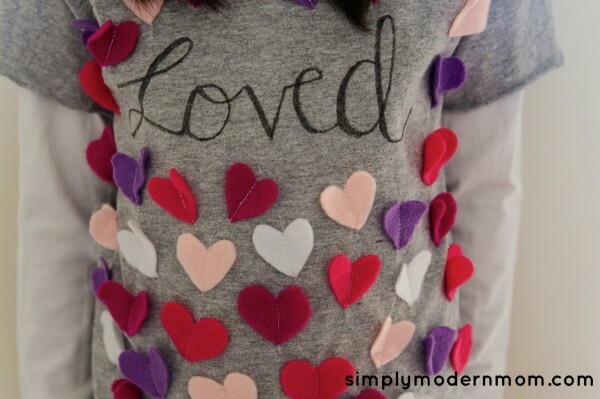 Cut out all 100 felt hearts. Since I used a pen, I made sure I cut right on the pen lines so it doesn’t show up on the felt. With the sewing machine, top stitch the hearts in place by sewing a line down the middle of the heart. Start the stitch above the center of the heart and sew a straight line down until you go a few stitches below the bottom tip of the heart. Then I reversed and sew a straight line back up to the starting point. Do that 100 times and cut all the little threads. I used a fabric marker to write the word “Loved” across the chest of the shirt. Then according the instruction of the fabric marker, I heat set it by tossing it into the dryer. You can also heat set it by ironing it. Read the instruction on your fabric marker to get detailed instructions. And done! See, pretty simple. Just takes time. But a pretty fun shirt for Valentine’s Day and 100th day of school. And I’ve tossed this shirt in the washing machine with the shirt inside out. Then I hung to dry. This is how it looks afterwards. » Tell me… Does your children’s schools celebrate the 100th day of school? What do they usually do for it? Hello, February! I am back into the blogging world today to share with you a free printable Valentine that the kids can use at school for their friends. I designed this for my daughter’s class to hand out to other second graders. 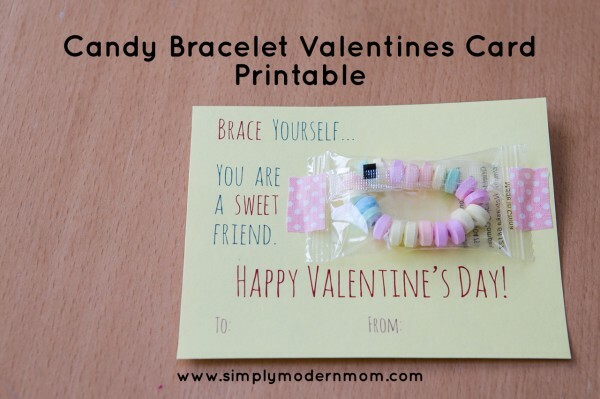 It’s a simple card with a fun candy bracelet that everyone loves. Click on the link after jump to download the printable. I ordered a box of candy bracelets from Amazon for a cheap price. It’s individually packaged and ready to go. Then I printed these cards out on regular 8 1/2 x 11 inch card stock paper. I actually took it to a print center that charged about $0.50 per sheet. I brought my own card stock because I wanted the cards to be a certain color. Lastly, I taped the sides of the bracelets package to the card using fabric tape I had, or you can also use washi tape to make it cute. I made 32 Valentines for $12.00 with leftover candy bracelets. If you have a color printer at home you can print it out and save yourself some printing cost. And there’s also the bubble Valentines printable that you can also use too. Two fun options for a simple and quick Valentines to keep your life easy. 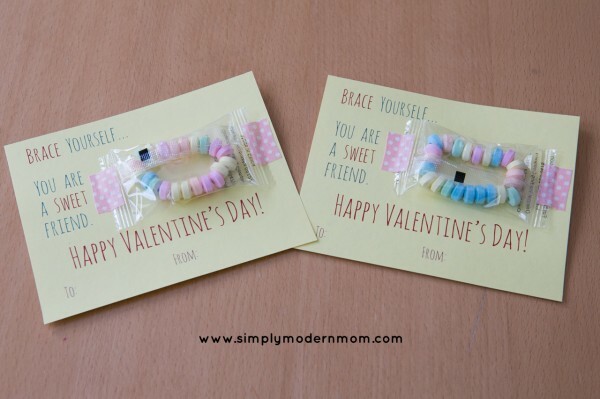 » Tell me… How many Valentines do your children hand out to classes and friends? New Pinterest Boards. I created a bunch of new Pinterest boards that you may want to follow. Boards such as “I Wanna Dress My Kids” with cute kids clothes, mostly for girls… But what can I say? I’m a little biased to girly stuff since I have only girls here. And “I Wanna Write” with fun ideas for sending snail mail or calligraphy stuff. And of course, “I Wanna Love Me Some Shoes” with gorgeous shoes for you to drool over. 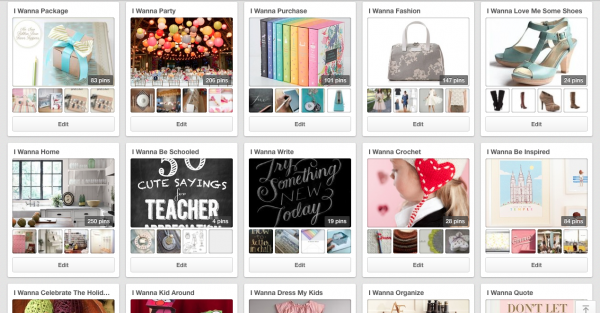 And “I Wanna Be Schooled” with school ideas and teacher gift ideas. There are few more other fun boards, so go check it out! Desktop Background Love. I just downloaded a new background for me desktop and my iPhone. It’s such encouraging words for me. You can bring some loveliness to your desktop too by checking out these free desktop backgrounds on Design Love Fest. Fall Wreath Ideas. My Houzz ideabook this month is filled with fall wreath ideas that would look nicely in the house or on your front door. Go see them before it’s too late to put up fall decorations. Snapware Pyrex Storage Containers . We recently made the switch from plastic storage containers for leftovers and such to glass ones. These Pyrex ones in particular. It’s awesome! They stack so much better, they don’t go everywhere, they store so much food, they are microwaveable with no BPA, they are oven safe, and so much more! » Tell me… What’s new with you? What are you up to this weekend? Are you ready for fall and the holidays?